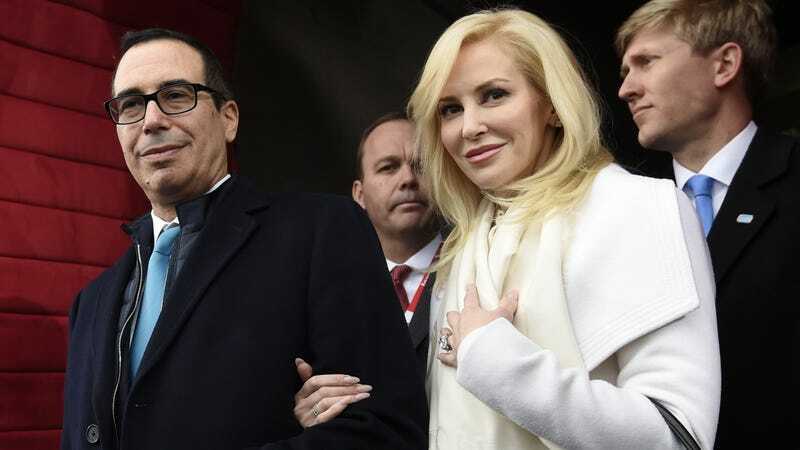 Louise Linton, new wife of Secretary of the Treasury Steven Mnuchin and certified tone-deaf pool noodle, has apparently learned nothing from being mocked by an entire African government for her wildly delusional portrayal of a few months she spent in Zambia. I dare say she may have even outdone herself in this incredibly ill-advised Instagram comment, posted to an account since set to private but not before it was screen-grabbed, naturally. Hmm, a rant about “self sacrifice” alongside a photo surfeit with tagged designers, namely: #rolandmouret pants, #tomford sunnies, #hermesscarf, #valentinorockstudheels, #valentino. Sounds like our Louise! To be fair, Mnuchin was forced to divest financial interest in the films he “produced,” including the smash box office hit Wonder Woman, which must have been just harrowing considering the film’s incredible success. Was it as harrowing as the night Linton spent in mortal fear of the (fictional) Congolese rebels; that terrible, sleepless time spent “clenching [her] jaw to stop [her] teeth chattering?” Probably not, considering Mnuchin is still estimated to be worth around $500 million. The Washington Post reports that Mnuchin’s use of a government plane was unusual for an in-country trip, during which officials typically fly domestic carriers. The pair was in Kentucky for Mnuchin’s appeal to Congress to overhaul the tax code, which Democrats have argued will result in deep tax cuts to the wealthy. The sacrifices, do they ever end?!?! Notably, Linton’s Wikipedia page has also been updated to reflect her most recent contributions to society. The happy news is that Linton is actually Scottish, so at least we’re not entirely to blame for this one. DEAR UNITED KINGDOM: Come get your girl.